My husband built our nightstands. We’ve had them for about 7 years now and I still love them. 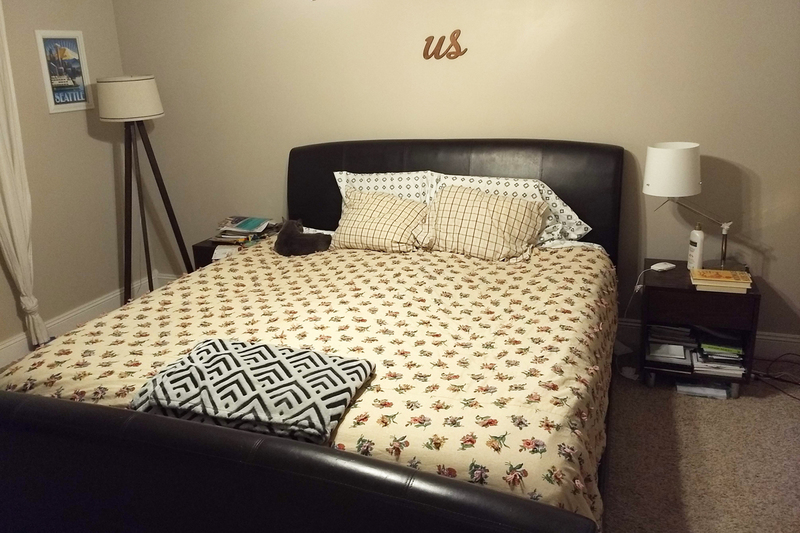 My side is on the right when you’re looking at the bed and his side is on the left. I didn’t tidy them up for this picture because I wanted to show how they look 99% of the time. We have matching table lamps from IKEA. (We’ve had them for so long that I can’t remember what they’re called and IKEA no longer carries them.) You can’t see both in this picture because our 4 year old swiped one to use in his bedroom. Since my husband’s lamp basically belongs to the kiddo now, we moved this floor lamp into the corner of the room. My husband also built that floor lamp as a gift for me several years ago. My husbands’ nightstand is usually a giant pile of magazines, papers, notes from the kids, and lego creation ‘gifts’ from the kids. He never cleans it off unless I threaten to toss it all. I keep the top of my nightstand pretty tidy but the shelf underneath (and the drawer) are a different story. They’re packed to the gills with old journals, notebooks, books, cards from the kids, etc. If you were to open the drawer of my nightstand you’d also find 15-20 pairs of earrings. I frequently get into bed and, realizing that I’ve forgotten to take my earrings out again, take them out and deposit them in the drawer so I don’t have to get up again. Typically we have this IKEA Blavinda duvet on our bed. When I’m washing it I throw one of my quilts on the bed- sometimes one I made for Andy as a Christmas gift when we were dating or this floral one that my mom made. PS- Those Threshold diamond sheets are from Target and they are amazeballs. I have another set in a different pattern. They have a double elastic layer on the corners so you never have to fight to get the sheet to fit the bed. Seriously- go get yourself some. On my nightstand I keep my current reads. Right now it’s The Sixth Extinction, Elizabeth Kolbert. I always have lotion – my favorite brand is Aveeno Daily Moisturizing. I’m not a fan of the Goldbond lotion I have right now. My skin gets super dry, especially in winter, so I sometimes have to reapply my lotion before I go to bed and in the middle of the night. Also sitting there is my phone charger and earbuds (which you can’t see in this photo), an elastic for my hair in case it gets annoying in the night, and our Summer Infant video baby monitor. 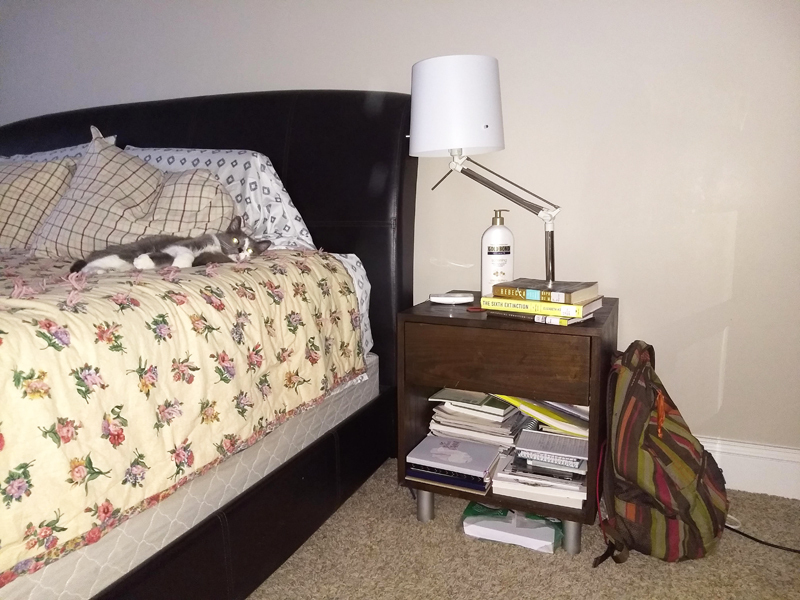 My husband and I each have our own Colette Espresso Nightstand (from Crate and Barrel) – his side is on the right (when facing the bed) – he’s closer to the front of the house – and mine is on the left side (closer to the porch and back of the house). Since it’s winter and the heat is constantly on, there’s always a water bottle on my bedside (not pictured). I tend to fill it with ice and bring up a bottle of water before I go to bed – I’m using the Contigo Stainless Steel Water Bottle which is fantastic – I wake up with ice still in the bottle. – the tub which is much thicker than the lotion – and a bottle of 100% Organic Argan Oil (from Trader Joes). The Argan oil is an awesome mix in for lotion – and even on my face since it’s non-comedogenic. Nothing else can handle my skin in the winter. You;ll also find my Carmex Wintergreen Lip Balm. I have that and a few other different places in multiple locations. Also on the of my night-stand is the book I’m currently reading – The Black God’s Drums, P. Djeli Clark – which is a new-to-me author which is for the January Monthly Motif Reading Challenge. Below it are the next 2 books I plan on reading – Vengeful, V.E. Schwab, from Our Fresh “To Be Read” List for 2019 … and then my pick to read for the February #MonthlyMotif Reading Challenge – The Poppy War, R.F. Kuang. Other items you’ll see – a picture of with me, my dad and husband, and my weekly planner. My nightstand also has a bottom shelf – and on it I keep my electronics which charging – laptop, tablet and phone + more books that I plan on reading. Both bedrooms look so comfy! I just went to IKEA and bought bedroom furniture & some living room stuff for the house I’m moving into in a few days. It’s supposed to be delivered Monday. I love IKEA, they have great products and even better prices! I’ll be checking out that water bottle and Argan Oil. @Vicki We just (a few months ago) got our bedroom furniture! We never really had any “grown up” stuff. I love both of your bedrooms. They look so comfy and relaxing. 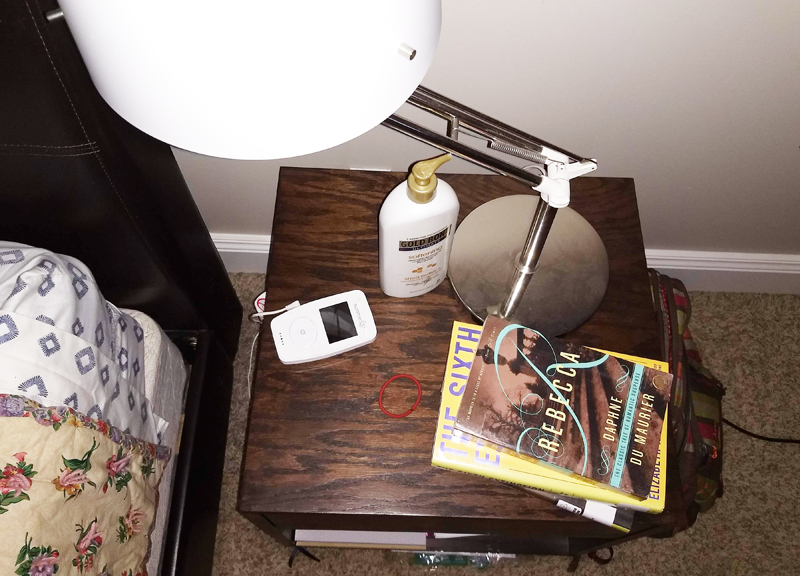 I love seeing what’s on nightstands, in purses, in backpacks, on coffee tables, etc. I notice there is a cat for each side of the bed in Kim’s room. LOL Mine looks more like Tanya’s with several different dry skin combatants. @Jinjer I love those types of posts too!